Jungle Creatures Fabric – Can’t Get Enough of This Line! 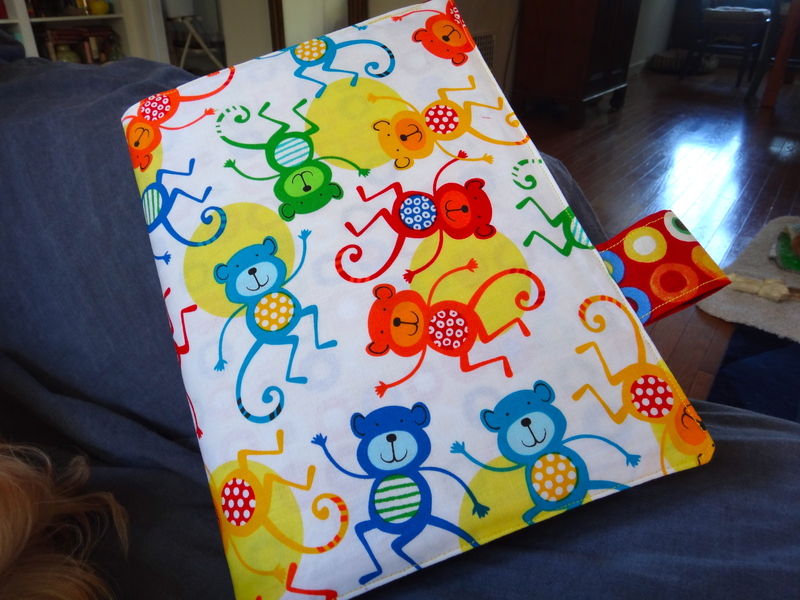 So is anyone else in love with Amy Schimler’s new line of fabric, Jungle Creatures? I absolutely love it! The colors are vibrant and her designs are just too fun. I seem to love every line she does – I think it’s because her colors are great and her animal designs are always super cute. I can’t get enough of her stuff! Right now I am working on a quilt top using her Jungle Creatures line. My work-in-progress quilt top looks really busy, but I like it anyway. I need to make about 18 more blocks and then I’ll figure out what comes next. Probably something in black and white to keep all that color contained 🙂 and then more crazy colorful stuff as the outside border. The block pattern I am using is inspired by a post I saw on someone else’s site last week. I remember she called her quilt Man at Work, but rats – I can’t remember the name of her site. Anyway, I thought she had such a neat pattern so I thought I’d try it out with this fabric. 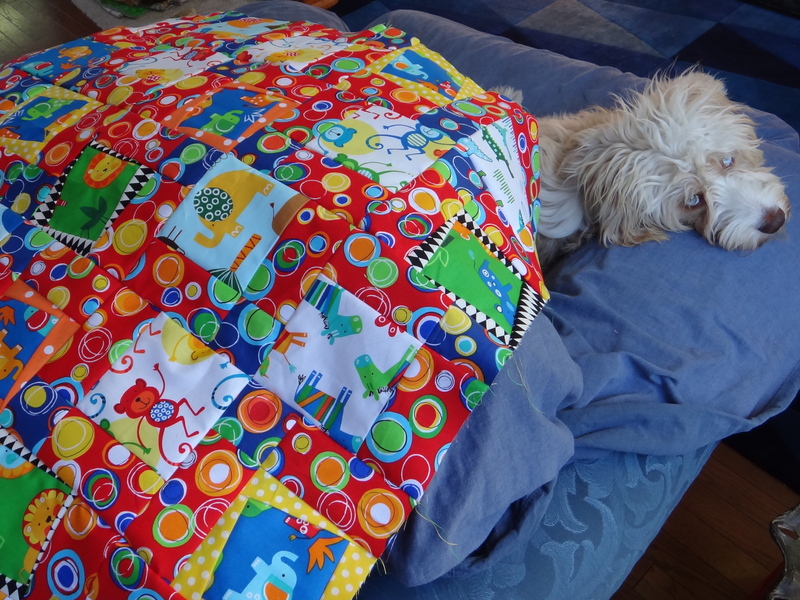 Thank you person with the cool quilt – I should have written down your website address! Here’s a picture with my little Kevin. This is before he plucked my work-in-progress off the chair and ran around the house with it like a wild little beast 🙂 He was so pleased with himself! Just linked up with Lee at Work in Progress Wednesday at http://www.freshlypieced.com/?wref=bif and Kelly at Needle and Thread Thursdays at http://www.myquiltinfatuation.blogspot.com/ I really need to figure out how to add those buttons to my sidebar! Heavens to Betsy! Hi Elita – I’ve been enjoying your website. Your All Framed Up Quilt in the pinks turned out beautifully. I love those fabrics! I love all the fabric! I am having s much fun with this line! I wish it would come in a minky-type fabric as well! Great fabric and such wonderful colours!! I just love how bright the colors are. I almost embarrassed to confess that I have bought 3-4 yards of each of these fabrics! Tee-hee! 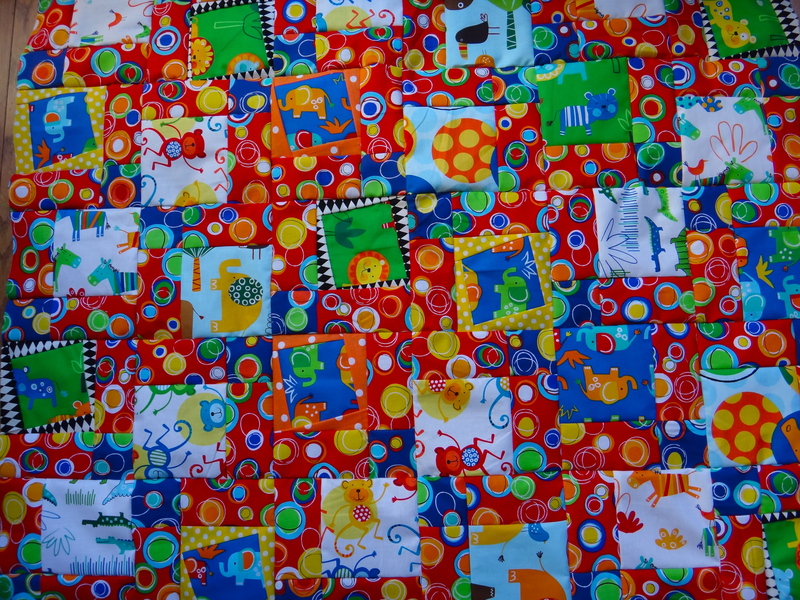 love the cheery fabrics, and I love the wonkiness mixed into the quilt. by the way- a text link is perfectly okay, but if you want to add the button here’s how- just copy the code from the box below the button on my page, then go into the layout tab in blogger. click on “Add a Gadget,” select html, and past it in. voila! Hi Kelly – I am going to try the button thing this weekend 🙂 I may have to draft my tech savvy daughter into service! Also, your carousel quilt is gorgeous! The colors are stunning and the block is very fun. I have not seen that block before – it’s a winner! Thanks 🙂 Looking forward to sewing some more Jungle Creature blocks today! Love that fabric!! ← Discovering Fat Quarter Bundles!